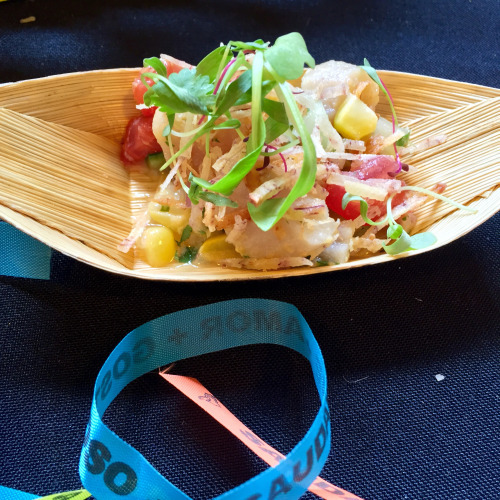 Amidst food and wine enthusiasts alike, I found myself soaking up the ambience that radiated at the world-renowned Evergreen Brick Works during the 2015 Toronto Food and Wine Festival. Setting afoot this venue for the first time, I was in awe of my surroundings – traces of rustic-industrial, country-chic and Mother Nature enveloped the entire vicinity. As someone who is fascinated by both street art and food, I found that this Don Valley gem was the perfect location in marrying these two. Already recognized as the first organization to start building gardens across Canada, the Evergreen Brick Works also champions the coming together of community and food. At this inaugural event, I witnessed first-hand how this was showcased – just as their motto advocates – with “good food, happy people, and a healthy city”. Atop the media preview tour that I was there to participate in, we were greeted by our hosts, who gave us the general overview of the then forthcoming event. Spotted in the crowd were celebrity figures Roger Mooking (Everyday Exotic), Brad Long (Restaurant Makeover) and Gail Simmons (Top Chef). I saw glimpses of how the three-day long event was planned to unfold. Different sections of the Brick Works devoted to various special mini events, such as cooking classes and demonstrations, and Chef’s Talks, were primed and well-equipped. Lights strewn across in rooms, picnic tables and benches scattered throughout, and food and wine vendors abound, the place seemed ready for the throngs of people waiting to be entertained. After the tour, with my plus one by my side, we hopped from one area of the Brick Works to the next. Our first stop was a Tutored Tastings session. For that particular hour, author and wine connoisseur Ana Fabiano presented the history and offerings of Rioja. Sipping on the five Rioja samples prepared for the audience, the wanderlust in me perked up at the vision of Spain and its vineyards on a screen across of me. Imagine being in the presence of the real deal – how majestic would that be? Meanwhile, my friend immediately favoured the Faustino V Tempranillo Rosado 2014. Had she been able to, she would have bought a bottle of this red wine then and there. I can tell you that the greater part of our wine consumption for the day involved this brand (which continued on to the next part of the agenda). Heading onward with our food adventure, we proceeded to the central hub of all things food and wine that weekend. Dubbed as the Grand Tasting Pavilion, it acted as the epicenter of the main event, where the space was abundantly occupied with food and wine stations endorsing the vendors’ respective products. Following is a sample of this vending population. Of Indian origin, this Sev Puri is “a delicious, savoury staple of Mumbai street food.” Akin to a tostada, crispy puris are topped with potatoes, tamarind and coriander chutneys and fried noodles. Serving Indonesian fare with this Babi Guling – Balinese roast pork, pickles, peanuts on an ice berg wedge, my palette recognized a celebration of spices. If you are hunting for some game meat, cupped within is their game toast featuring elk, water buffalo, caribou, and venison. Popularized at the Kensington Market location, this chicken and waffle had a sweet and spicy sauce accompaniment that tickled the tongue. Chorizo, potatoes, caramelized onions, and a special green sauce all fit in this one bite-sized mouthful. Easily one of my favourites, this simple but hearty piece of shawarma slider with hummus, tabouleh, feta, tzatziki, and pickled things left me both satisfied, but gluttonously wanting more. Niche to organic and vegan eaters, this seemingly innocent baguette crostini layered with cashew chevre and smoked beets with Maldon Salt packed a delicious punch to my taste buds. Quack Taco - this Singaporean duck ensemble, adorned with bamboo intestines, pickled beets, and Pulse’s special samba sauce, deservedly claimed its RSVP’d spot in my belly. Bringing a taste of the ocean, a Nova Scotia scallop was atop a bed of butternut squash risotto, topped with pumpkin seed oil. This swordfish ceviche with corn, cucumber, tomato, passion fruit dressing, and taro chips mirrored in taste the vibrancy of its colours. This UK-based chocolatier serves organic and fair trade chocolates – my plus one particularly fancied their dark chocolate with peppermint oil. Holy cannoli, it’s chocolate praline cannoli! Biting into this deep-fried coconut bae lumpia oozed with an explosion of coconut-caramel fusion. Mimicking the daintiness of its name is this rosewood wildflower honey & Riesling Savarine. Flavour combinations include Lemon & Lemongrass, Apple & Ginger, Pear & Vanilla, Cherry & Cinnamon, and Peach & Habanero. Make no mistake – this tiny glass of margarita was a potent one. This rye in a can is best served chilled. Leaving Evergreen Brick Works with our stomachs full, that day of celebrating food was indeed a great and memorable one worth replicating.